Columbus, OH - From Columbus MetroParks, "Severe flooding and debris blocking majority of Alum Creek Trail. Will clear by tomorrow afternoon when flooding has subsided. Stay Safe!" Columbus, OH - From MetroParks, "Please be aware of flooding on the trails. Take care and do not ride through standing water if you do not know the depth. Stay safe." Columbus, OH - From Columbus MetroParks, "Please use caution. Flooding and storm debris along sections of trails. Crews conducting clean up." Columbus, OH - From MetroParks, "[On] August 15, 2018 between 7 am - 6 pm expect temporary closures between Innis Park and Easton Socccer Fields for tree removal." "...Expected construction duration will be through the first week of September 2018. Columbus, OH - "The paved Greenway path connector from east of Alum Creek Trail in far north Columbus along I-270 to/from Emrick Rd (Dempsey Rd & SR-3) was recently reopened. Columbus, OH - From Columbus MetroParks, "Flooding on the Olentangy and Alum Creek Trails." This alert is from Columbus MetroParks today. This alert from Columbus MetroParks did not specify which areas may be affected along the two trails. From Columbus MetroParks, "The Alum Creek Trail is flooded north of 3 Creeks Park." Facilities: At the parks along the trail route. Worth Noting: An 11-mile section of the trail is utilized by the cross-state Ohio-to-Erie Trail as it makes its way through Columbus. As with many trails that move through urban landscapes, there's a lot to see along this bikeway. The trail skirts alongside housing developments, roadways, businesses, a golf course, recreational facilities and parks. It bobs and weaves along the Alum Creek, moving under bridges and across the creek numerous times. As with the Olentangy Trail, connecting parks along its route is a major objective, linking the trail with water and restroom locations. The trail also pays homage to a great bike racer, Major Taylor, who receives trailside honors. Bikeway visionary Ed Honton is also remembered with a plaque and bridge dedicated in his honor. Ed founded the Ohio-to-Erie Trail project in 1991. 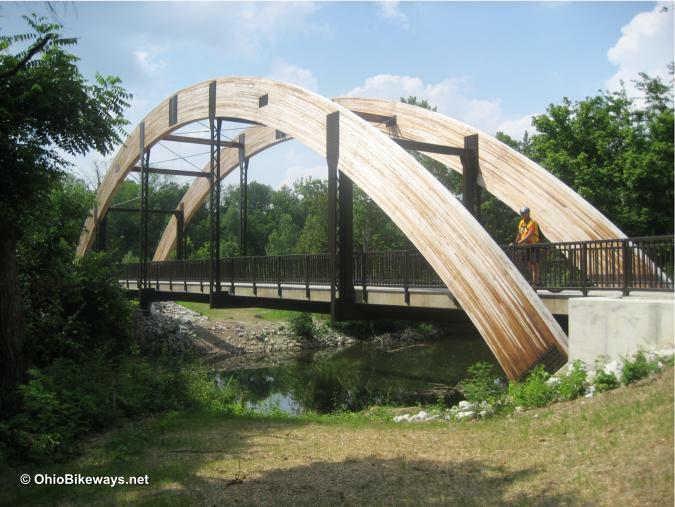 If you are a fan of bridge design and architecture, you'll see an interesting variety of examples along the bikeway. 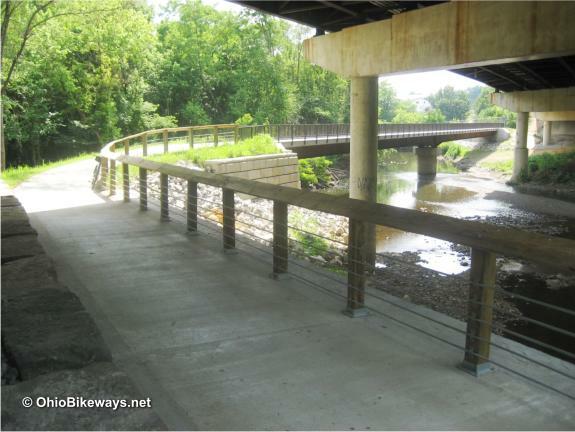 The trail does a wonderful job of avoiding many busy road crossings by using bridge underpasses along the creek. This adds continuity to your ride and keeps you moving along. The only downside is that a number of these underpasses are prone to flooding and can be impassible during high water. With some bikeways, such as the Ohio & Erie Towpath, trail closures due to flooding are not unusual. The heavy layer of dried mud we encountered along several Alum Creek underpasses demonstrates that it too suffers from flooding. For recreational riders this is a minor inconvenience. For commuters or those using the corridor for travel, it may require some alternate route planning. Trail signage keeps you up to speed on the park names and distances as you travel. The occasional 'You are Here' plotted on a large trail map sign shows you the big picture and gives you proper perspective. Some signage is also located where connecting spurs join the main trail and gives distances and directions to nearby destinations. This is all very helpful. In the past, however, signage to help visitors stay on the main trail was inadequate. Hopefully that issue has been addressed. Riding off course is not a favorite pastime for most trail riders. Unless they do so intentionally. As the trail was constructed, it was tied in with existing older segments at various points. As a result, you'll travel on surfaces that run the gamut from excellent to fair. But overall the surface condition is quite good. On the Sunday that we visited the trail, the parks along the route were filled with people enjoying soccer and basketball games. The Easton complex is nice, only to be outdone by its Westerville counterpart further north where a grid of bikeways covers the city. For those who have not seen such a concentration of trails in one area, it makes quite an impression. It's obvious that ped and bike travel is a valued priority within the local community. 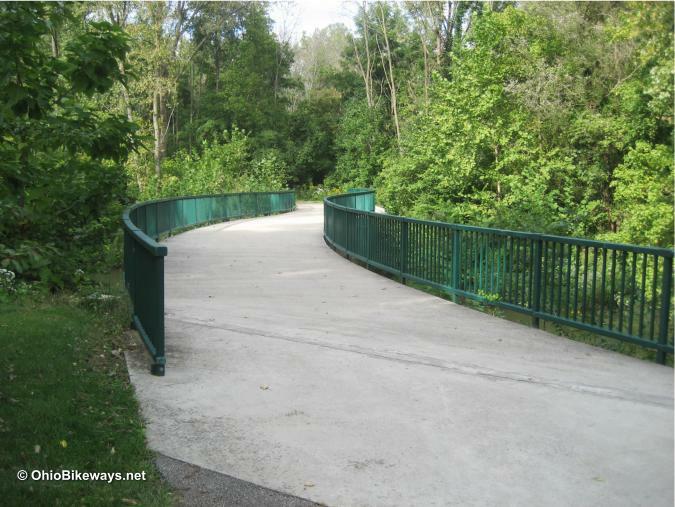 The Alum Creek Greenway Trail roughly parallels the Olentangy Trail which runs alongside the Olentangy River to the west. The two trails share similarities as both use waterway greenbelts that connect with parks along their routes. Both connect with bikeways to the south as well. The Olentangy to the Scioto Trail and the Alum Creek to the Blacklick Trail. At Cooper Park we noticed a signed bike route that connects the two trails. Look for more bikeway connections in Columbus in the near future.